$4.50 For 1-Year Rachel Ray Magazine Subscription & Other Magazine Deals Today 3/6 | A Savings WOW! 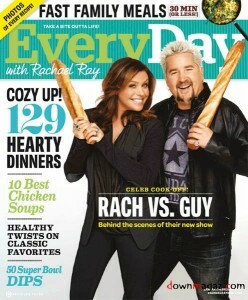 Today only, subscribe to Every Day with Rachael Ray Magazine for only $4.50 per year (81% off)! You can order up to 4 years at this price! Just enter coupon code SAVINGSWOW at checkout. This offer expires at Tuesday 03/06/12 11:59 PM EST. – Order Prevention Magazine for only $3.99 per year (76% off)! You can order up to 3 years at this price! Just enter coupon code SAVINGSWOW at checkout. This offer expires at Tuesday 03/06/12 11:59 PM EST. – Order Jet Magazine for only $3.50 per year (86% off)! You can order up to 2 years at this price! Just enter coupon code SAVINGSWOW at checkout. This offer expires at Wednesday 03/07/12 10:00 AM EST. – Order Marie Claire Magazine for only $3.76 per year (62% off)! You can order up to 5 years at this price! Just enter coupon code SAVINGSWOW at checkout. This offer expires at Sunday 03/11/12 11:59 PM EST. – Order Bridal Guide Magazine for only $3.76 per year (62% off)! You can order up to 3 years at this price! Just enter coupon code SAVINGSWOW at checkout. This offer expires at Sunday 03/11/12 11:59 PM EST. Get your discount magazine subscriptions today!